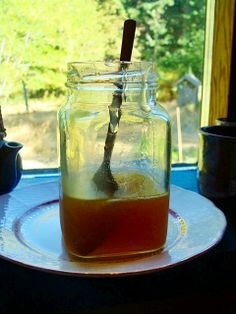 MY SIMPLE RECIPE FOR BEE-FREE "HONEY"
This will be a short little post. I have posted this recipe on Facebook a couple of times, but never here on my blog. I thought it was about time to post it here. As a vegan, I just didn't eat honey for a long, long time. It's not that I crave it, but every so often there's some recipe that just needs it, or it sounds comfy to stir some into tea with lemon when you have a cold. So one day, I experimented with various syrups and combinations, and this one was our favorite. BRYANNA'S SIMPLE HOMEMADE BEE-FREE "HONEY"
Closest I’ve come to the real thing. 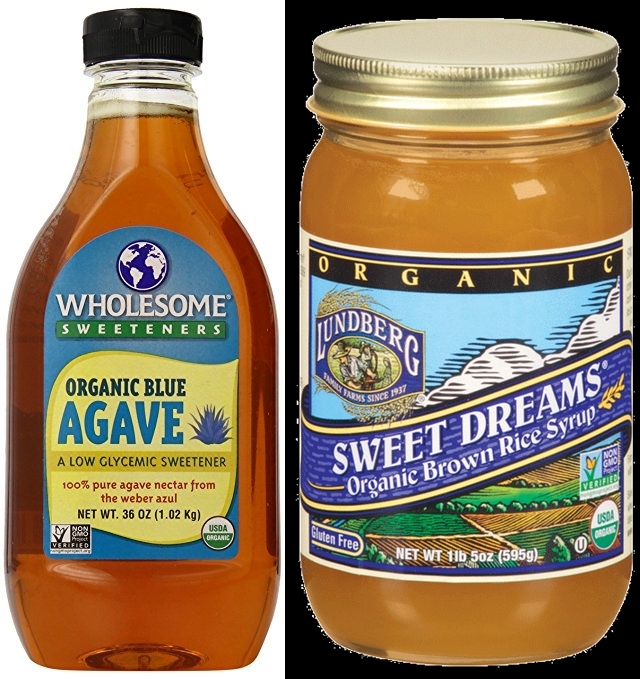 Check out the photo below for the brands I used and the color of agave syrup I used. 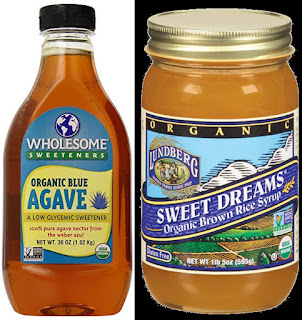 You can use your favorite brands, but I think the more caramel-colored agave syrup is best in this recipe. Hint: Very lightly oil the inside of your measuring cup and the syrups will more easily pour out. Mix the ingredients together well and store in a covered jar in the refrigerator. It firms up a bit after a few hours of chilling. PS: One could infuse this mixture with lavender or whatever flavor of honey you liked "back in the day". You may have already read my first blog post on making soy yogurt-- a small batch cultured in jars-- in the Instant Pot at this link. If not, you might want to check that post out anyway, for why I use soymilk, whether or not you should be wary of soy, what kind of soymilk I use, etc..
After having many failures with making soy yogurt, I finally had success using the Instant Pot and that's what that blog post was about. But on the Facebook Group "Instant Pot Vegan Recipes" there was a discussion about that blog post and one commenter (whose name I cannot recall and I could not find that particular thread on this popular group) wondered why I bothered making it in jars and why I bothered heating some of the milk up, since the Instant Pot would bring it up to temperature anyway. 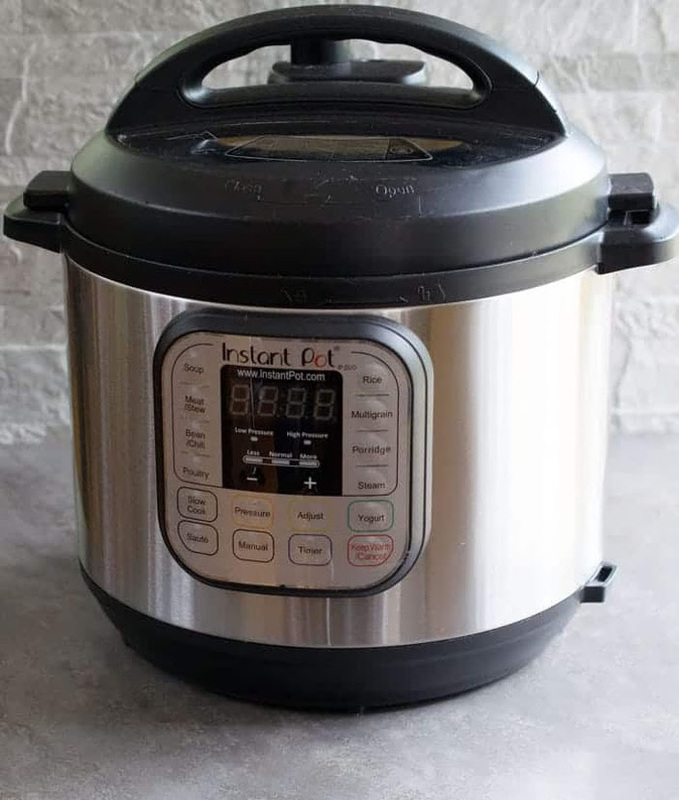 I thought it was very covenient having it made in the jars and I had had some failures previously making it right in the Instant Pot insert, so at first I dismissed the idea. However, I thought about it some more and it made sense to make a larger batch right in the IP insert and not to have to heat up any of the milk. So, I thought I'd give it ago-- if it didn't work, well then, we would have smoothies all week. I was afraid that the yogurt would thin out or separate while transferring it to the jars after it had set, but, again, I thought it was worth a try. It actually worked quite well. The Instant Clearjel® used as a thickener keeps it stable. But the yogurt was a bit lumpy and then you had to transfer it to the jars and clean the insert. So, I've been experimenting again. My goal was to make a nice creamy, non-lumpy, tasty and tangy soy yogurt with minimal ingredients, minimal fuss, and consistently good results. I preferred not to have to heat up the soymilk first (and, with ultra-heat-treated [UHT] soymilk off the shelf, you don't need to! ), and I wanted to avoid using a thickening agent that 1.) needed to be cooked before adding to the soymilk, and 2.) added a starchy taste and/or odd mouthfeel to the yogurt. I believe that I have succeeded in reaching my goal with this revised recipe of mine, and I hope you will try it, and give me some feedback. Before I give you the new recipe-- Do we really need to use a thickener? I've read so many blog posts and FB post and comments about making vegan yogurt and I scratch my head at how some people produce a soy yogurt so nice and solid with no thickeners at all. I have come to the conclusion that soy milks and other plant milks are vary in some way so that some of them thicken without help, and some don't. Instant Clearjel® (not regular Clearjel® , BTW) proved to be the answer to making nice creamy yogurt that will hold its shape without having to cook it before adding to the yogurt mixture. IMPORTANT TIP:When using a fairly large amount of Instant Clearjel® in a blended recipe, I do the following: I mix the liquid ingredients in the blender and then turn speed to low and carefully spoon the Instant Clearjel ® into the center of the vortex of liquid. This keeps the Instant Clearjel ® from clumping up and/or sticking to the sides of the blender jar. And what kind of soymilk? 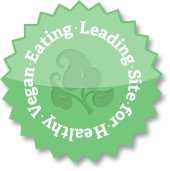 I use organic soymilk, original style, ultra heat treated; in a Tetra Pak carton. The brand I use is PC Organics Fortified Soy Beverage, Original, a Canadian brand-- I prefer "original" to "plain". But brands and tastes vary, so you will have to experiment with brands available in your area to see which brand you like. Some folks claim they have had success with Silk from a refrigerated carton, but I have not. ALWAYS use soymilk from an unopened carton, whichever brand or type it is, to avoid contamination. What are the savings from making your own soy yogurt? It costs me about $4.50 Cnd (about $3.40 US on March 14, 2017) to make 2 qts (8 cups) of yogurt, plus about 1/2 cup extra. When we were buying soy yogurt it cost us about $5.00 Cnd for 3 cups! 1.) Sterilize/scald all equipment with boiling water, including the blender jar and lid. 3.) Pour this yogurt mixture into the batter bowl/pitcher and add the remaining carton of soy milk; whisk briefly but thoroughly. 4.) Pour it carefully into the 4 prepared jars, right to about 1/4"/.635 cm from the top of the jar. Secure the lids, but NOT tightly. (The yogurt will settle and sink about another 1/4"/.635 cm down when it is refrigerated.) If you have a little of the mixture left, see the Note highlighted in yellow at the bottom of the Equipment List above. 5.) Do not use the little rack that comes with the Instant Pot-- it will raise the jars up just high enough to cause a problem with the lid. Place the jars right into the Instant Pot insert (topping the jars with the little dish of extra yogurt mixture right in the center, if you wish-- see photo above). 7.) When it's done, it should be thick and creamy. Remove the jars carefully and secure the lids more tightly. Refrigerate for at least 8 hours before serving. 10.) If your yogurt looks as if it has separated and/or curdled in the jars, and perhaps has overflowed a little, taste it. a.) If it's nice and tangy, that probably means you have over-fermented it and next time set the timer for less time. b.) If it is not tangy enough, that probably means that you should use a new starter next time. c.) Either way, don't toss it out! Scald a small whisk and slim silicone spatula, and rinse off and scald the jar lids again. Whisk the yogurt right in the jar with the scalded whisk, until smooth and creamy. Wipe the rims with a paper towel and screw on the newly-scalded lids. Refrigerate as usual. PS: If you ever see pink liquid in your yogurt, throw it out. Nutrition (per 1/2 cup serving): 57 calories, less than 1 calories from fat, 2g total fat, 0mg cholesterol, 26.1mg sodium, 160mg potassium, 5.9g carbohydrates, less than 1g fiber, 3.2g sugar, 3.2g protein, 1.4 points. These are the Uttapam that I made from Kathy's recipe. With the wild popularity of the Instant Pot these days (a Canadian product, I just have to add! 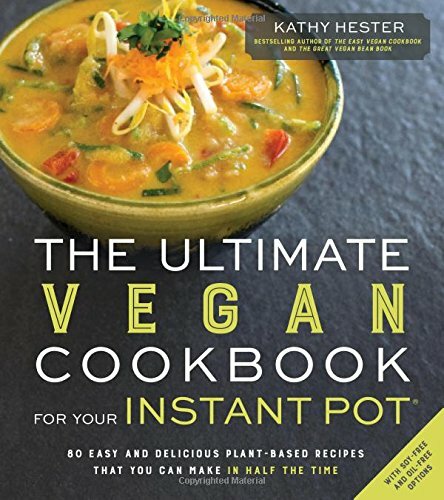 ), cookbook author Kathy Hester has done vegans a massive favor with the publication of her new book "The Ultimate Vegan Cookbook for Your Instant Pot". I've had an Instant Pot for more than a year now and I love it. It saves counter space, it makes lovely soy yogurt, it's a slow-cooker, a pressure cooker, a steamer and more. I cook big batches of beans in it for freezing, and brown rice, too. Obviously, I highly recommend it. This new book is full of tempting recipes, but, when I was trying to decide what to make for this review, I was immediately drawn to the uttapam recipe. I love uttapam and we have it for breakfast or lunch fairly often. It's a mixture of dal (dried legumes-- usually urad dal, which is white, but is actually split black urad dal, minus the black skins-- it's sometimes called white lentils) and some sort of grain, soaked, ground and fermented before cooking like small pancakes, often with thinly-sliced veggies cooked into the flip side. I make my uttapam with urad dal and oats, but I was intrigued by Kathy's mixture of Urad dal, brown rice, millet and quinoa-- wow! This is a wonderful high protein, whole grain mixture. 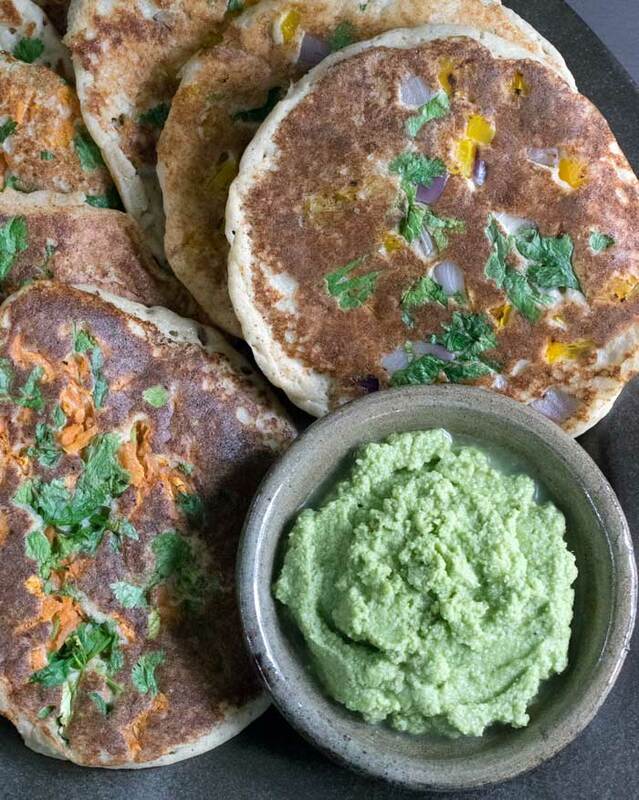 Uttapam is blissfully easy to make and the batter will last for a week in fridge. Kathy's recipe makes alot of batter, so I halved the recipe for just the two of us. I also added 1/2 cup more water to the half batch of batter because I like my uttapam a bit thinner. (I also added a bit of salt to the batter because it brings out the flavors-- Kathy avoids salt in her recipes, but I'm afraid I'm not anti-salt.) I usually top the uttapam with thinly-shredded veggies, like cabbage, carrot, peppers, or even thawed frozen peas and/or corn. 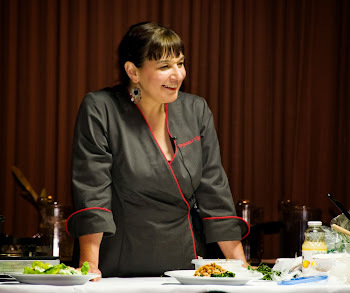 You can use Kathy's suggestions, or anything that sounds good to you and cooks quickly. Uttapam is served with dal, sambar, chutney, etc. If I have nothing else suitable, I just serve them with chutney and soy yogurt, as in my photo above. These pancakes are light and tasty and full of little holes, but two or three make a substantial meal and leave you well satisfied. 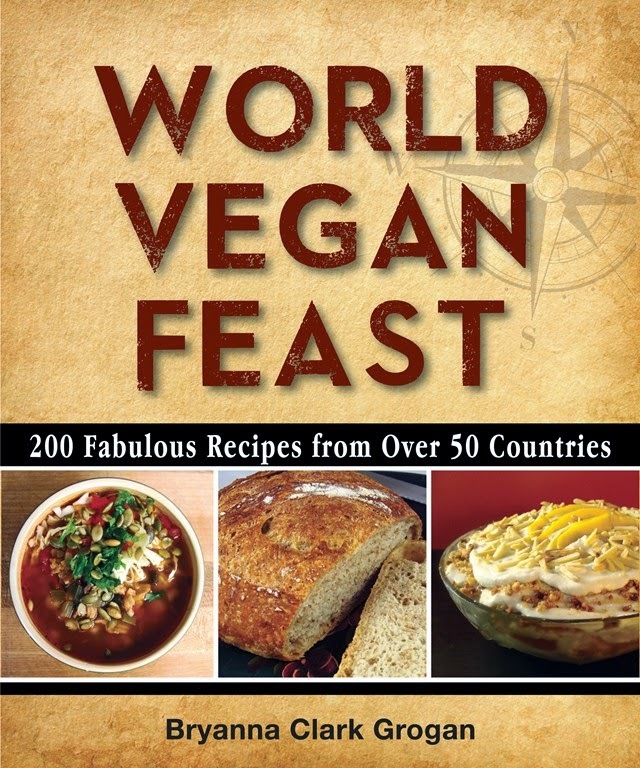 A terrific way to eat cheap and nutritious beans and whole grains! UTTAPAM Note: I didn't make the Cilantro Coconut Chutney which went with this recipe because we're not big cilantro fans. Mix the urad dal, rice, millet, quinoa and water in a large bowl. Cover and let soak to soften for 8 hours. Next, puree the mixture in your blender in batches and add to your Instant Pot liner. Place the liner in your Instant Pot, cover and press the yogurt setting. Leave it at the default 8 hours for it to ferment. You can store the fermented mixture in your fridge for up to 1 week or you can cook up all the pancakes at once and freeze them to heat for later. Sprinkle the topping you choose (I used sliced green onion this time; BCG) over the top of the pancake and press in a little with your spatula. Flip the pancake and cook until both sides are browned. Note from Bryanna: I served these with soy yogurt and chutney this time.